As Facebook’s CEO Mark Zuckerberg fingered his cheat sheet of canned answers to a barrage of questions from Senators yesterday on how Facebook had allowed a Trump-backed political operation to harvest personal data from 87 million of its users, Zuckerberg attempted to channel motherhood, apple pie, dorm room entrepreneurism and an altruistic desire to connect people around the world in one harmonious melding of human spirit. Another uncomfortable moment came when Senator Patrick Leahy asked if Special Counsel Robert Mueller had issued subpoenas to Facebook. Zuckerberg first answered yes and then later said he wasn’t sure. What Zuckerberg was sure about was that Facebook employees had been interviewed by the Special Counsel’s office but he had not so far been interviewed. One of the most eyebrow-raising moments came when Senator Maria Cantwell opened her line of questioning by invoking the name “Palantir,” a data mining company which received early funding from the CIA and whose co-founder, billionaire Peter Thiel, has sat on the Facebook Board of Directors since April 2005. Thiel contributed over $1 million to the Trump campaign and chipped in $100,000 for his inauguration according to the Center for Responsive Politics. CANTWELL: Thank you Mr. Chairman. Welcome Mr. Zuckerberg. Do you know who Palantir is? CANTWELL: Some people have referred to them as Stanford Analytica. Do you agree? 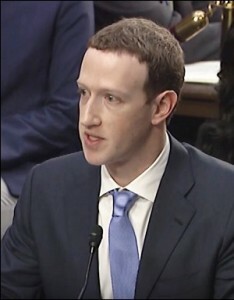 ZUCKERBERG: Senator, I have not heard that. CANTWELL: Ok. Do you think Palantir taught Cambridge Analytica, press reports are saying, how to do these tactics? ZUCKERBERG: Senator, I don’t know. CANTWELL: Do you think that Palantir has ever scraped data from Facebook? ZUCKERBERG: Senator, I’m not aware of that. CANTWELL: Ok. Do you think that during the 2016 campaign as Cambridge Analytica was providing support to the Trump campaign under Project Alamo, were there any Facebook people involved in that sharing of technique and information? ZUCKERBERG: Senator, we provided support to the Trump campaign similar to what we provide to any advertiser or campaign who asks for it. The CIA’s venture capital fund, In-Q-Tel, was an early investor in Palantir, plunking down a cool $2 million alongside many more millions from Thiel, the billionaire co-founder of PayPal and an early investor in Facebook. The Senate hearing at which Zuckerberg appeared was a joint session of the Senate Judiciary and Commerce committees. Zuckerberg wore a suit and tie rather than his standard attire – a t-shirt.